The announcement that came yesterday wasn’t much of a surprise. It was inevitable, but that doesn’t mean it wasn’t also sad. 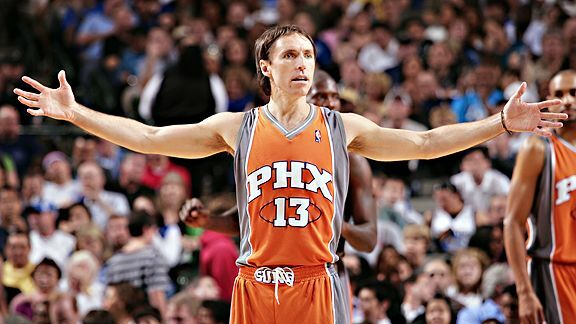 When I was a kid Steve Nash was one of my favorite players in the NBA. Nash was the point guard for the Phoenix Suns when the Suns were one of the most entertaining teams on the planet. For a few years, including two straight where Nash won the NBA MVP, the team was a fast paced, “seven seconds of less” war machine. Nash was the reason why this team worked. He played the game at a mental level that not many people have ever been able to accomplish. My favorite part about his career might be an interview he gave to Chuck Klosterman for Esquire (which later appeared in Chuck Klosterman IV) which discussed how fascinating he was as a player and a person. That interview can be found here. No, I take that back. My favorite moment from Nash’s career, excluding every on court moment he ever had, was shortly after he joined the Los Angeles Lakers. Nash passed by some fans on the freeway who had recognize him and then proceeded to be given a beer by the fans all while riding in the back of a taxicab. It’s for simple things like this that I will pose that Steve Nash is one of the coolest players in NBA history, and certainly my generation of fans, for being a genuinely interesting guy. He’s 41 now with a bad back. No matter what people thought was going to happen otherwise, the days of two-time MVP Nash were long gone. Now we can enjoy the guy off the court for the interesting mind he is rather than stand beside him in disappointment as his body betrayed him. It’s not the happiest way to go, but I have a gut feeling this next chapter will bring about more fun things with Steve Nash and basketball in some way. Call me an optimist all you want, but this isn’t necessarily bad news. Have fun in retirement Steve. After all the fun you’ve given the NBA in the last decade and a half you have earned a rest.